How to place rectangular plates at an angle between wedge plates? So in my winter village layout I would like to place various small builds (like the market stalls from #10235) on a not 90 degree angle. I know you can do something with jumper plates but I would really like to have everything at the same level. With a bit of experimenting I found a couple of not-so-great solutions. 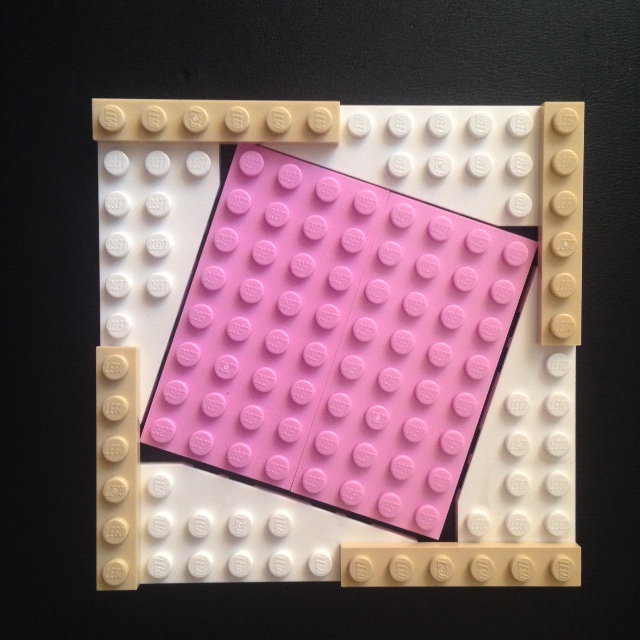 This is a 6x8 plate in a 13x14 square. Here I have a tight fit of 7x7 enclosed in a 11x11 square. 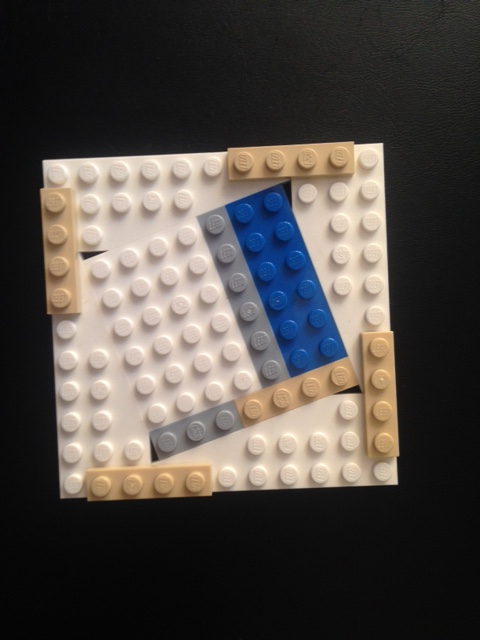 A 8x8 plate with too much spaces around it in a 12x12 square. I think you're fighting against geometry. The plates you're using have either an 18.43 degree angle or a 45 degree angle, which have non-integer hypotenuses. 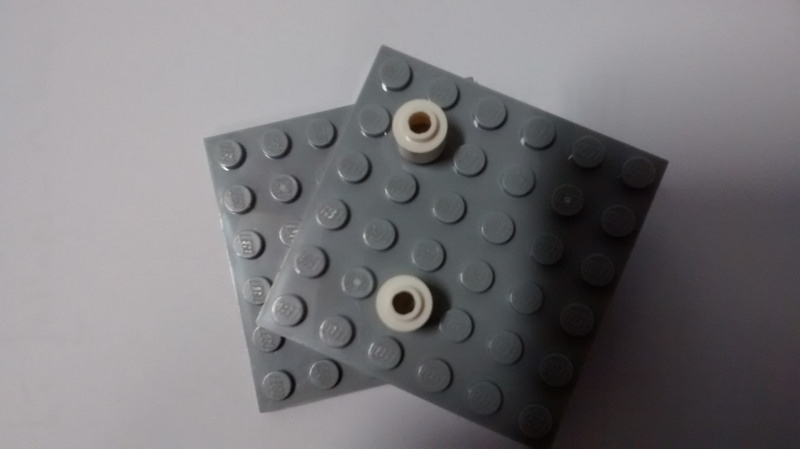 The hole for your enclosed 4x4 plate (for example) is sqrt(2)*3 studs (about 4.24 studs), which leaves a 0.24 stud gap (1.94mm), which is only 0.12 studs when placed "centrally". 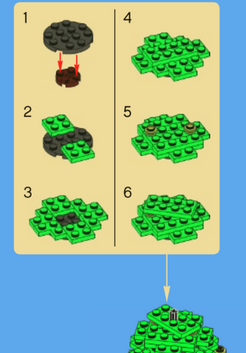 LEGO doesn't make any "wedge plates" (in BrickLink-speak) that are integer-based right triangles (Pythagorean triples), but it'd be great if they did. In the meanwhile, we're left with with "fudging it". 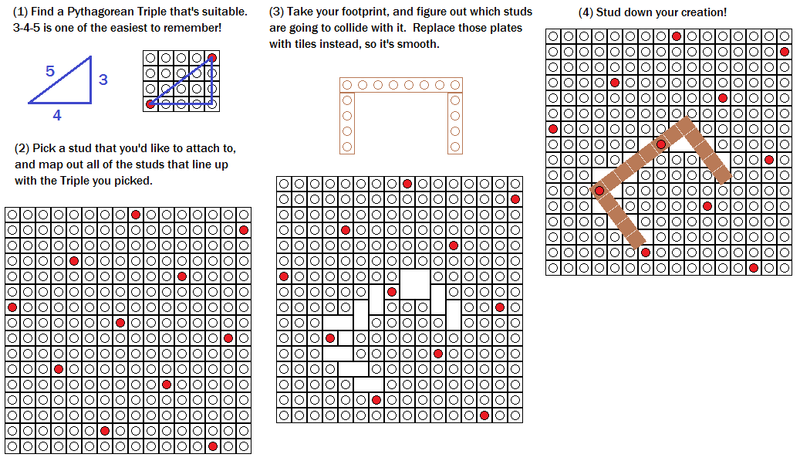 If your hole is (say) 7.98 studs wide, you might be able to squeeze a full 8 studs inside there-- or if it's 8.04 studs wide, you can see if the small gap is objectionable. I'm not sure if there are any combos that work especially well at the scale you've got. If (say) you were looking to get a full 48x48 baseplate or more rotated at a funny angle, there are a few oddball options that might work. But in the "16-studs-and-under" size, not too much. There may be other oddball things (like your 2nd option) where there's some space left at the corners, rather than uniformly all around, but I'm not aware of any offhand. 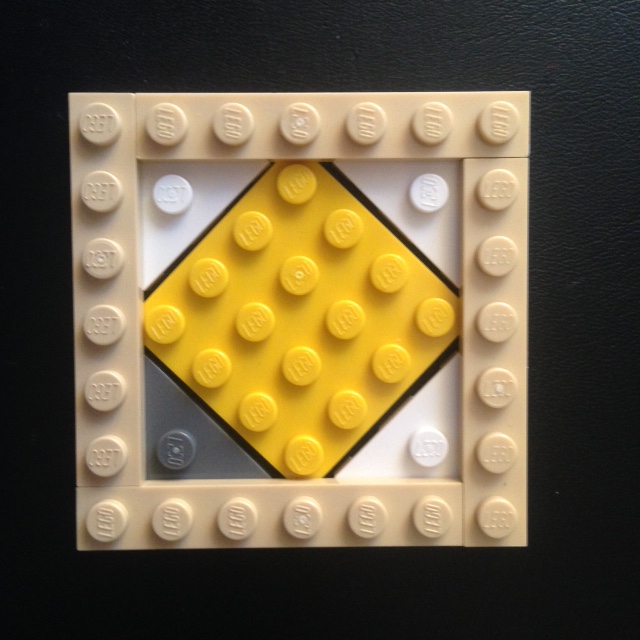 Using 4 of them, you can get a hole that's 4.12 studs square, at a 76 degree angle. That's not too bad, but it's not a big square to work on. That'll get you a 12.17 stud hole, with an 81 degree angle. 2) Cover up the holes. Some strategically located small "snow mounds" scattered all around can hide the holes, and provide a different landscape texture. 3) Put white plates/tiles, or even just white paper underneath the holes. With everything else going on in the scene, I'm not sure the gaps would be all that noticeable-- particularly when they're white. Wow! this is the most in depth answer possible I think! Thank you very much for your time to explain this. Do you have an example of your alternative solution #1? There is a very simple way of doing it if you don't mind going up by one plate thickness. 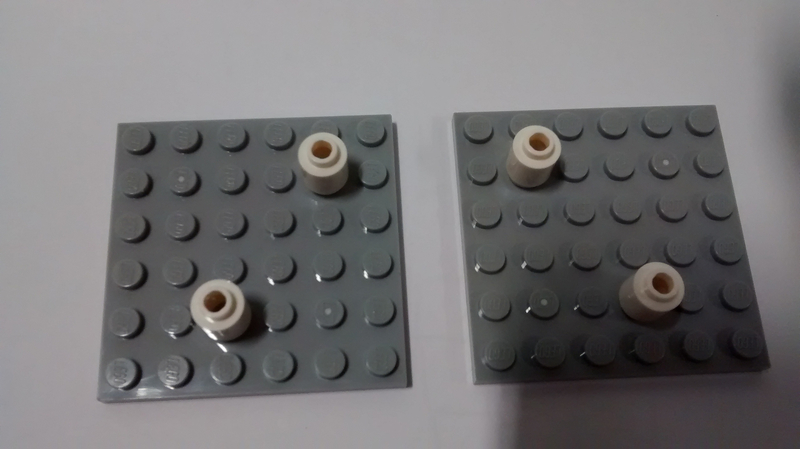 Take a look at these two pairs of cylinders (you can use 1x1 plates too, square or round, it doesn't matter). The distances between the pairs are exactly the same. They are just mirror images of each other. So place one plate on top of the cylinders on the other, so that the cylinders are above each other. You don't actually need the studs on the top surface, they are just there to show the alignment. The plates are now angled with respect to each other and locked in that angle. 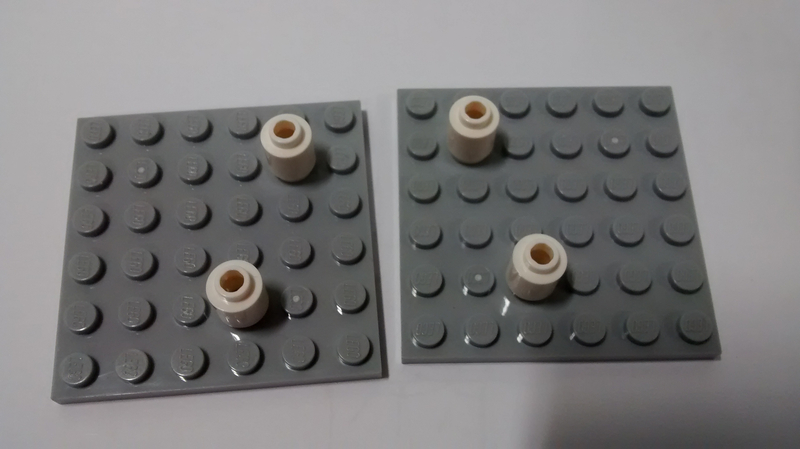 For bigger plates you can places more single studs in the right places, or use tiles where they don't match exactly. This clearly lifts the plate up by one brick (or one plate if you use a 1x1 plate) but securely locks in the building on top. It is a technique used to build the tree in the Winter Toy Shop (see steps 5-6 here). It doesn't have to be that distance apart though. You can choose any pair and it works, and so get almost limitless angles. And no worrying about getting exact Pythagorean triples, as the distance between the two points are guaranteed to be the same. And if you use a brown plate instead of white for the base of the stall, it just looks like the stall has a wooden floor instead, with the studs underneath acting as feet to keep it up off the snow. ^I was going to recommend a similar concept as I just built the Toy Shop tree last night. I like the idea for added stalls at various angles a lot. I may have to follow your lead and give it a shot. 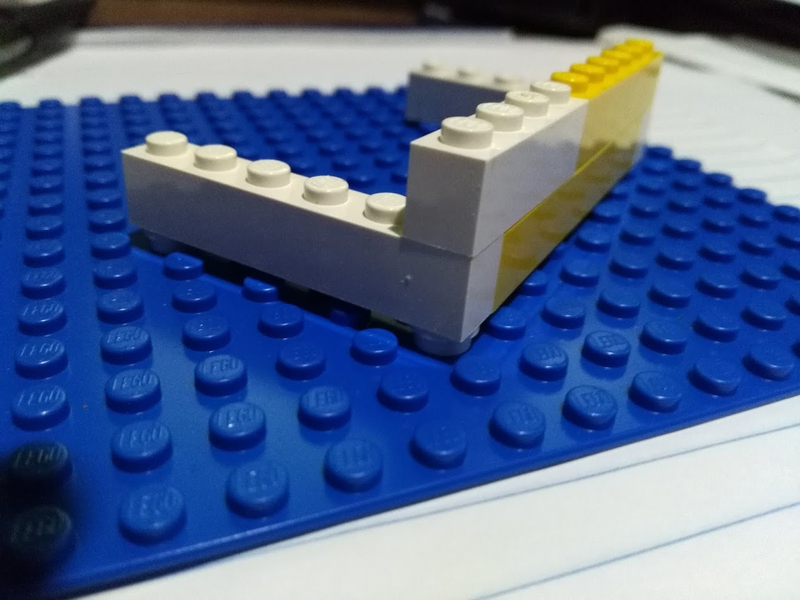 Sorry, I don't have any handy photos of how a finished MOC would look, but I'm sure there are a lot of pictures of this technique out there! Simplest option if you've some thickness to work with is to place a turntable under the section you want angled, and have plates closing the gaps below the turned structures base. ^^ It doesn't have to be integer pythagorean triple (like 3-4-5). And you don't have to remember any either. 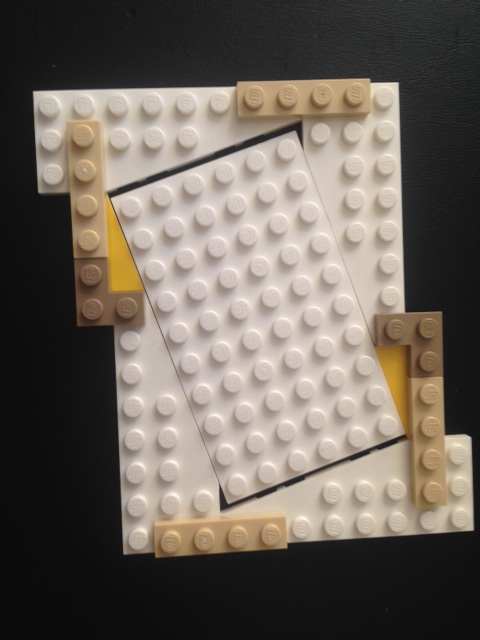 For example if we wanted to fit this 3x5 stud building shown as orange onto a surface and are going to use the tiles to create a flush surface, then you can place the connection points in many places. Of course, this building doesn't have a way of doing a 3-4-5 triangle (as it is really 2x4 when considering distances between studs). But here you can pick any pair of studs and find a perfect match. For example, here (red) 2x4 studs apart or (purple) 1x4 apart or (blue) 1x3. 2x3 is another possibilty. These are not integer pythagorean (root 20, root 17 and root 10 respectively), but so long as you overlay them on another pair that are the same distance apart (so the hypotenuse is the same length) they will fit. Of course, this is using Pythagoras theorem, just not integer based. 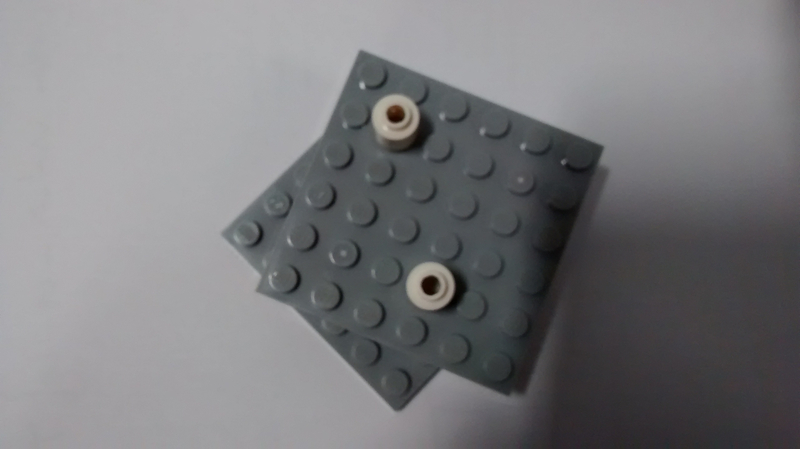 Then just remove the conflicting studs underneath replacing with tiles as above. Obviously if you are happy to use tiles in the surface and remove the white plates from the bottom of the stalls, then this way will also allow them to sit flush with the surface. Ahh, good point! I hadn't ever attempted that, but makes perfect sense! I think everyone used to be so hung up on the 3-4-5 that it was rarely discussed. 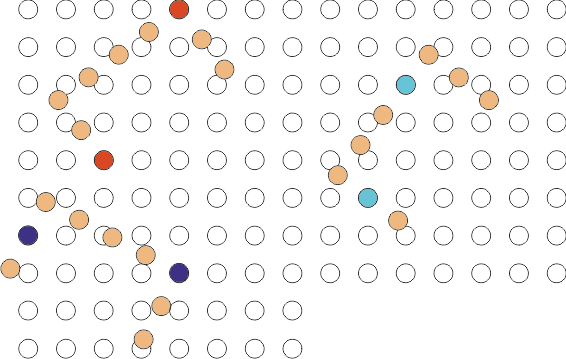 Of course the integer method is necessary if you want the connection points to be in specific places on a straight side of a build, for example, if they are visible pillars. If you can stand a little gap at the bottom of the stalls, you could add a 1x1 to the bottom of the stall at a couple of spots and use those to attach to the base plate. Really just a variation on suggestions made above by @CCC.